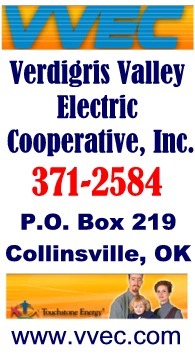 A Regular Session of the Collinsville City Commission will be held at 7:00 p.m. on Monday, November 1, 2010, at Collinsville City Hall, Commission Chambers, 106 N. 12th Street, Collinsville, Oklahoma. A. Approval of October # 2 Payroll in the amount of $41,714.60. B. Approval of Claims in the amount of $58,967.10. C. Approval of Minutes of the October 18, 2010 Regular Meeting. D. Approval of Supplemental Budget Amendment in the amount of $6,759.20 for Lawn Mower purchase from Cemetery Care Fund. E. Approval of Cemetery Deeds: Mike Kight, 4 spaces; Gwendolyn Kay Carr, 1 space; Robert Gary Carr, 1 space. F. Approval of Third Renewal Agreement for Fire Equipment Lease and Mutual Aid Agreement with the City of Tulsa. G. Approval to close Main Street on Saturday, December 11, 2010 from 5th Street to 15th Street from 9:30 a.m. to 12:00 p.m. for the Annual 2010 Christmas Parade. * (Chamber's) Christmas Parade will extend to 5th St. this year. and Budget Administration, Chapter 2, Section 2-408 when competitive bidding not required, amending Section 2-408(1) allowing the Collinsville Municipal Authority or the City Commissioners to waive competitive bidding for the purchase of supplies, materials, equipment or contract services when the cost does not exceed fifty thousand dollars ($50,000.00), providing for severability, repealing all ordinances in conflict herewith and declaring an emergency and effective date. -- approved, had been at $25K (matching state law) which was recently raised to $50K. This just keeps city in line with state law but allows bids if desired for $50K and under purchases. Non-bids process can be faster and less expensive, and still allows city to explore best prices less formally (per City Manager Polk). 10. Discussion and possible action to approve the purchase of three (3) 2010 Ford Crown Victoria Police Interceptors in the amount of $65,501.45 using Ford Municipal Finance Program. -- item tabled after lengthy discussion which appeared leading up to approval of 3 new police cars to improves safety of aging police fleet which has been purchasing used (50K miles) Kansas patrol cars in recent past. Three new vehicles are planned to be purchased and 4 of the highest milage existing vehicles retired. The item was tabled as the financing will likely be with RCB (or possibly one of the other local banks who have not yet been contacted) instead of Ford as the agenda specfied. 19. New Business (business which was not foreseen prior to the posting of this agenda.) -- None, but comments of appreciation for all involved helping with Officer Andy Wileman recent fundraisers with brought in about ~$8K. 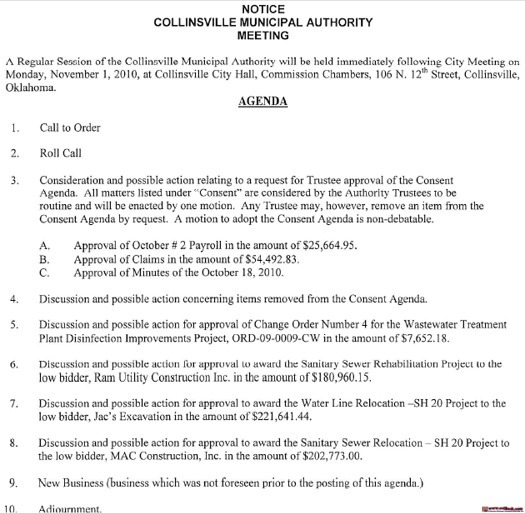 A Regular Session of the Collinsville Municipal Authority will be held immediately following City Meeting on Monday, November 1, 2010, at Collinsville City Hall, Commission Chambers, 106 N. 12th Street, Collinsville, Oklahoma. A. Approval of October # 2 Payroll in the amount of $25,664.95. B. Approval of Claims in the amount of $54,492.83. C. Approval of Minutes of the October 18, 2010. 5. Discussion and possible action for approval of Change Order Number 4 for the Wastewater Treatment Plant Disinfection Improvements Project, ORD-09-0009-CW in the amount of $7,652.18. -- approved, UV disinfection project completed (last Friday). These changes were incorporeted during construction including a change in amperage and adding 2 step-down transformers after delivery different than design anticipated. Still within available funding. 7. Discussion and possible action for approval to award the Water Line Relocation SH 20 Project to the low bidder, Jacs Excavation in the amount of $221,641.44. -- approved, ODOT paying for S-Curve work (14th to Nursing home). 6 bids received.